This ornament artist aims for a realistic representation of the subject and achieves it in the chimpanzee glass personalized Christmas ornament. The detail in this blown glass piece is excellent, so it's a great choice for animal lovers and those who support the WWF or similar organizations. As you browse our animals ornaments personalized for the recipient, you'll find a handful from this artist, each with the same attention to accuracy. They are all finished in similar hues to make a very handsome collection. 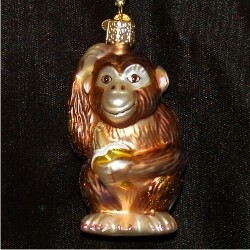 The exclusive Russell Rhodes velvet pouch is included with the glass chimpanzee Christmas ornament. I collect animal ornaments Dec 28, 2014 Marti G.